 Department of Business and Sustainability, TERI University; Principal Scientist, CSIR-NISTADS”. Associate Professor, Department of Business and Sustainability” TERI University, New Delhi, INDIA. A significant numbers of researchers have performed quantitative analysis of doctoral dissertations on various subjects like management, educational technology, industrial design and library sciences etc. Huang, Che-tsao (1980) described the doctoral dissertations in educational technology primarily on faculty-doctorate and faculty-student ratios. And emphasized on positive networking between guides help improve the quality of the PhDs. Pao-Long and Pao-Nuah (1997) analysed the dissertations on management technology and assessed that teachers’ network creates environment for a certain topic to flourish. Cafferella and Steven (1990) studied the doctoral dissertations in Industrial Design and Technology and reports that a large number of students are concentrated at few institutions and controlled by network of few professors. Sugimoto, Cassidy R. et al. Studied the doctoral degrees in library sciences in a time series manner. The present paper analyses the human research dimension in renewable energy sector in India in terms of no of Phds, growth pattern, area wise distribution and networking. Further, the paper also discusses the output of the universities and the orientation/inclination of the researcher after completing PhD. The paper is quite significant keeping in view the importance of the human resource development and management in an emerging country like India. The paper contributes new data in capturing data related to research in renewable energy and such a data is extremely useful by both policymakers and researchers in planning appropriate policies for development and management of human resources in renewable energy research. Database. Based on the data from INDCAT (PhD), the names of guide and the student were searched in SCOPUS to find out their output, affiliation and research interest. 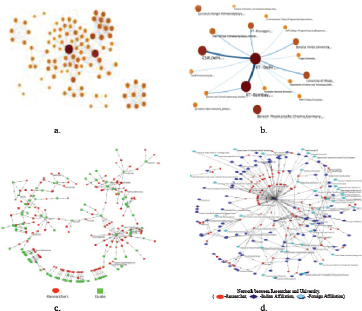 Pajek based social networking analysis depicts a strong international, interuniversity, and peer to peer bonding for the research networks in the areas of renewable energy technologies. What is the trend of growth of PhDs in Renewable Energy Technology? What is the contribution of Universities in yielding PhDs? What are the different areas of Renewable Energy Technology that have been covered in the PhDs and their distribution over time? How the PhDs are distributed throughout India? What behavior does a Researcher exhibit after completing PhD? What is the network structure among Researcher, Guide and University? How the international/National collaborations between researchers, guides and universities evolve? Pajek network diagrams were drawn to understand networking between various stakeholders. Core-Periphery model of Affiliations is analyzed. A total of 344 Doctoral Dissertations on Renewable Energy Technology are considered at 74 Universities throughout the country. There is an erratic growth of doctoral dissertations over the time period. There are peaks between 1980 and 1991 and also after 2003 but in the 50’s, 60’s, 70’s and 90’s; there is an absence of fair number of dissertations (Figure. 1). Almost 46% of dissertations are completed after 2000. During the 56 year period, an average of 6 dissertations is awarded per year. Over the time period, the number of doctoral dissertations varied from a minimum of 1 in 1956 to a maximum of 27 in 2008. If we examine dissertations according to dissertations per decade then the findings are quite surprising with only 1 dissertation in 1951-1960 and 1 in 1961-1970. On the other hand, 156 dissertations are produced from 2001 to 2012. The distribution of dissertations according to the category to which they belong is shown in Figure. 2. The titles were categorized into thirteen categories, namely Bio-Energy, CO2 Capture and Storage, Energy Efficiency, Geothermal, Greenhouse Technology, Hydro Power, Hydrogen Fuel, Natural Gas, Nuclear Energy, Solar PV, Solar Thermal, Waste Management, Wind Energy. This categorization was done by the introspection of the title of the Dissertation. 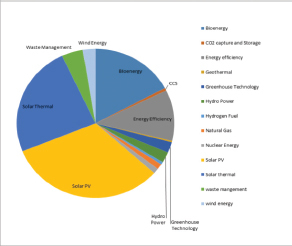 Solar PV is the most assertive one with 32% share in the dataset followed by Solar Thermal and Bio-energy which accounts for 24% and 17% respectively of the entire renewable energy dissertations. The distribution is also presented over the time period in Figure. 3. Solar Thermal and Solar PV are mostly concentrated in the 80’s and also after 2000. Bio-energy is evenly distributed over the time period. Waste management, Natural Gas, Hydrogen fuel, Green-house Technology, CCS got attention only after 2000. As in Figure. 1, it is also evident from Figure. 3 that a major portion of the dissertations are completed after the year 2000. From the data it is observed that 344 Doctoral Dissertations are awarded by 74 Universities. And it is visible that the Doctoral Dissertations are unevenly distributed in the universities throughout the country (Figure 4). The number of PhD’s in different universities is explicitly listed in Table 1. Indian Institute of Technology-Delhi alone takes the credit for more than 40% of the Doctoral dissertations followed by Devi AhilyaVishwavidyalaya (5%) and Jai Narain Vyas University (4.65%).The figures of these Institutes are far from IIT-Delhi. 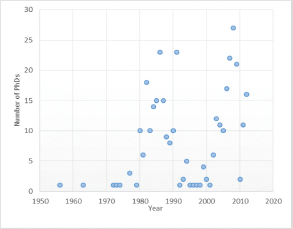 Frequency of Doctoral Dissertations in Renewable Energy from 1956 to 2012. 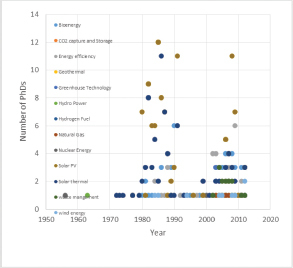 Time series of PhDs related to different Renewable Energy Technologies. Of the category of Renewable Energy, Solar Thermal is dominant in IIT-Delhi followed by Solar PV and Bio-energy. In Jai Narain Vyas University, 14 out of all 16 dissertations belong to Solar PV. Bio-energy and Solar PV are broadly scattered in Universities throughout the country. Bio-energy is present in 35 Universities, Solar PV in 32 and Solar Thermal in 21 Universities. On the contrary, Geothermal is present only in Indian Institute of Science. IIT-Delhi ranked first in the number of PhDs every year except in 90’s. Distribution of total doctoral thesis (a) and Thesis in Renewable Energy Technology (b) throughout India. 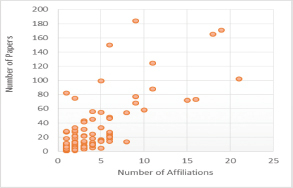 Correlation between Number of papers and number of affiliations of a Researcher. A comparison is drawn between the PhDs in Renewable Energy Technology and PhDs in all subjects throughout India. And it is found that that a significant number of PhDs in Renewable Energy Technology is concentrated in Delhi, Rajasthan, Madhya Pradesh and Tamil Nadu whereas a major proportion overall PhDs are aggregated in western Uttar Pradesh and Andhra Pradesh (Figure. 5). The 344 dissertations are guided by as many as 226 professors out of which 86 dissertations are mentored by 2 Guides per dissertation. Almost 43% dissertations are completed under top 14 professors. G. N. Tiwari from Indian Institute of Technology-Delhi is accountable for guiding 30 dissertations followed by HP Garg (17) and LM Das (12). The study is extended to obtain the trend followed by any researcher who has done PhD in renewable energy technology. For this purpose, Researcher information is extracted from Scopus. The data extracted included the co-authors of the researcher, number of papers by researcher, researcher’s publication range and affiliations. In this case, the 344 doctoral dissertations is our population. And out of 344 researchers, we were able to find information about 151 researchers who have done PhD between 1973 and 2012. The number of papers by any researcher is a quantitative indicator of the contribution of a researcher in a particular field. From the data, it is evident that Pramod Shankarrao has topped the list with 184 papers followed by Shiv Singh (171) and Sudhir Kumar Sharma (165). Over 6 researchers have written more than 100 papers in various fields. It is also attributed to the fact that all these researchers have co-authored their work with more than 150 professors (maximum 150 co-authors are displayed in Scopus). Over seven researchers have co-authored their work with more than 100 Professors. In order to show an author’s effectiveness, the h Index is explicitly listed in Table 2 which measures both the productivity and impact of published work of a researcher.40 out of 151 researchers spent more than 20 years doing research whereas 14 left research field after completing their PhD. Twenty researchers spent 10-20 years in research field out of that 19 are presently working in the research field. All in all, 89% of researchers have at least 1 research paper published after completing PhD. The H-Index and number of papers of top 10 researchers are shown in Table 3. Figure. 6 shows that there exists a good correlation between the number of papers and affiliations of a researcher which is found to be 0.768629. Where, 1 and 2 represents Core and Periphery respectively. The core consists of the Universities which have high density (0.756) of ties among themselves by sharing many researchers in common and the periphery consists of Universities which have low density (0.040) as few researchers are attracted to these universities. It is apparent from the network between Researcher and Guide that GN Tiwari from IIT-Delhi is more influential in the network. A network between researcher and affiliations is a 2-mode (bipartite) network which was converted to 1-mode, which created a network of affiliations in such a way that affiliations which share same researcher connects (Figure 7c and 7d). From the network, we conclude that there is total 1465 pair of affiliations. Out of which each of 1410 pair of affiliations share one researcher and each of other 55 pair of affiliations shares 2 or more researchers with IIT-Delhi and IISc-Bangalore sharing maximum,12 number of researchers. Similarly, a 1-mode network of researchers is created such that whenever two researchers share an affiliation, they connect. It is reported that out of 4323 pair of vertices, each of 4129 share 1 affiliation and rest 129 share twoor more affiliations. The density of the affiliations network is 0.0361783 which means that 3.61% of all possible combinations are valid. The Universities which form core are : Ajou University, South Korea ; Alagappa University,Karaikudi ; Chendhuran College of Engineering and Technology ; Florida Solar Energy Center, US ; IEEE,US ; IISC, Bangalore; IIT-Bombay; IIT-Delhi; National University of Singapore; Terra Industries Inc., Mississippi ; The Electrochemical Society, US ; University of Central Florida, US ; McMaster University, Canada. A bipartite network between researcher and universities was converted to a 1-mode network such that the affiliations which share same researcher connect. The network had 101 nodes with 578 links and a clusters of the universities was created using this. Figure 7a shows 19 modules with 28 links. Every module represents a cluster of nodes and the links between the modules represent the flow between the modules. The 28 links between the modules represent 81.1% of all flow in the network. The names of the modules are derived from the nodes with the highest pagerank in the network. The size of each module represents the denisty of the cluster within the module and the width of the arc(link) depicts the strength of networking among the modules. It is apparent from the Figure that IIT-Delhi is a hub module which connects 13 modules. IIT-Delhi with 22% pagerank has 9.8% of in/out flow. Out of 19, the top 5 modules, namely, IIT-Delhi, IIT-Bombay, CSIR-Delhi, Bereich Physikalische Chemie, Germany and University of Dhaka accounts for 74 % of the flow of the network. The strong link of the modules IIT Bombay and CSIR Delhi with IIT Delhi shows a high degree of research collaboration among them. The examination of the doctoral dissertations shows disparate presence of different renewable energy technologies with a major share to Solar PV, Solar Thermal, and Bio-Energy. There is a need to shift the focus of PhD aspirants towards wind energy and hydro energy as India has high potential in these areas too. On the positive side, it is found that after the year 2000, PhD is produced in almost every Renewable Energy Technology which is quite applauding. IIT-Delhi alone accounts for more than 40% of PhDs in Renewable Energy in India which demonstrates the institutions high participation and sensitiveness towards Renewable Energy Technology. The comparison of PhDs in all fields and PhDs in renewable energy technology all over India is done and it is found that a significant number of PhDs in Renewable Energy Technology is concentrated in Delhi, Rajasthan, Madhya Pradesh and Tamil Nadu whereas a major proportion of PhDs in all subjects is aggregated in Western Uttar Pradesh and Andhra Pradesh. Out of the 13 Universities which form core, 8 are foreign Universities and it shows high degree of collaboration between Indian and foreign Universities. The high density of core suggests that that the universities which constitutes core are able to coordinate their actions with ease as compared to the universities in periphery. Policy Implications: It is evident that there is a considerable amount of doctoral dissertations in renewable energy; which can translate to a good renewable infrastructure in the country. It is advisable to the universities to improvise their facilities for PhD programmers to attract students. The examination of the titles of the doctoral dissertation shows disparate presence of different RETs with a major share to solar PV, solar thermal and bioenergy. There is a need to shift the focus of the PhD aspirants for new technological space as India has a great potential for other solutions too. It is also evident that most researchers in renewable energy have successful careers. More than 5% of the total researchers have in axcess of 10 affiliations (i.e they shifted more than 10 organizations during their career). This shows high level of mobility for better opportunities among renewable researchers. As far as net-working among researchers and affiliations is considered, there are good number of researchers that share same affiliation. This interlinking of researchers are channels of communication among affiliations. IIT Delhi and IISc Banaglore sharing 12 researchers are more closely associated than other affiliations. 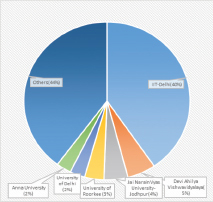 IIT Delhi with highest degree of centrality has more influence in the network. Authors are extremely grateful to UGC/INDCAT for providing the database (on website) for the analysis. Many thanks to Rohit for doing complicated Pajek graphs and contours plots.